Pakistan Auditor Accounts Complex. Main University Road. Gulshan-c-label. Block-II. Karachi No. EDU-VIII/2018-19/01 dated 17-12-2018 regarding Primary School Teacher Salary after Time Scale in Sindh by an office of the accountant general Sindh. Tire Secretary Finance Department Govt. Sindh Karachi. It is stated that this office has been receiving from the office of Directorate of Schools (Primary Secondary both) a number of cases of time scale awarded to Primary School teachers for which this office holds a different view from the office of Directorate Education In respect of criterion to count the length of service as detailed below. I) PST in BPS 07 at 25 years of service is entitled to the time scale of BPS 15 in accordance with your office order vide no. FD (SR-I) 1(52)/2010. Dated07-06.2010. However same PST in BPS 07 at 25 years of service is entitled (or time scale of BPS 16 w.e.f. 15-08-2018 in accordance with your office order dated: 05-01-2018. II) It is observed that on the same basis of 25 years of length of service an employee is entitled to BPS 15 as well as for BPS16. Please clarify the ambiguity in this regard. 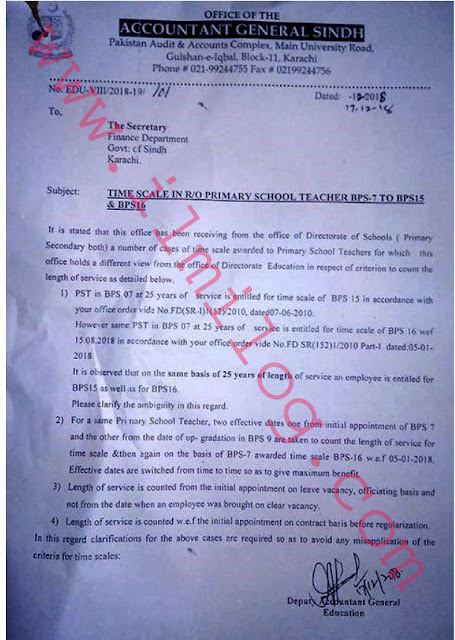 III) For a same Primary School Teacher, two effective dates one from initial appointment of BPS 7 and the other from the date of up- gradation in BPS 9 is taken to count the length of SCA ice for time scale &then again on the basis of BPS-7 awarded time scale BPS-16 w.e.f 05-01-2018. Effective dates are switched from time to time so as to give maximum benefit. IV) Length of service is counted from the initial appointment on leave vacancy, officiating basis and not from the date when an employee was brought on clear vacancy. V) Length of service is counted w.e.f the initial appointment on a contract basis before regularization. hi, this regard clarifications for the above cases are required so as to avoid any misapplication of the criteria for time scales.